2005 Kalia Road, Honolulu, HI 96815. Honolulu, HI, April 14, 2019 - Waikiki Beach Activities (WBA) is proud to announce its new online booking system. 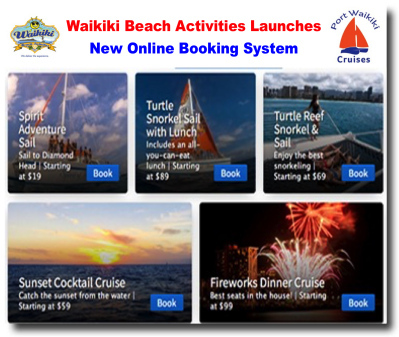 Visitors looking to make reservations for various beach activities including Port Waikiki Cruises boat tours can now visit WBA's website's Activities Booking page, select an activity or boat tour to view availability and easily make their booking online. "This new booking system makes reserving for any WBA activity or boat tour more convenient for visitors looking to make the most of their Honolulu vacation." said Rob Martin, President of Waikiki Beach Activities. "We are excited for our guests to experience an easy, seamless and integrated booking experience that allows them to schedule activities at their leisure, all in a safe and secure platform within our website." Online bookings are offered for all of WBA's activities, tours and lessons including it's popular Surf Lessons and Port Waikiki Cruises aboard the Spirit of Aloha. Guests can review details of any tour or activity, choose their dates from the automated online calendar, and securely check out without having to leave the website. Waikiki Beach Activities (WBA). Our name says it all. Since the late 80's WBA has grown to be one of the largest beach services in Waikiki. Our home is in the Hilton Hawaiian Village Beach Resort & Spa, the largest beach resort in the Pacific and it is truly a village on the beach that is the home of Duke Paoa Kahanamoku, the father of International Surfing and the Official Ambassador of Aloha. Our motto is Safety, Service and Sales. We offer beach boys, pool attendants, and snorkel instructors; and beach rental equipment, such as beach umbrellas, chairs, and chaise lounges, as well as masks, snorkel sets, fins, air mats, kayaks, boogie and surf boards, and aqua cycles. We also arrange Waikiki sailing tours, surfboard and kayak rentals, and canoe rides and surf lessons; and offers retail products. In addition, the company provides beach party activities, such as sand volleyball and badminton tournaments, sand tug-of-wars, canoe racing/rides, beach scrabble and golf, surfing, team building events, volley ball tournaments, kayak races, and rainbow water balloon toss activities; and event planning services to assist in organizing and budgeting beach activities. The company was founded in 1989 and is based in Honolulu, Hawaii. "In Hawaii, we greet friends, loved ones or strangers with Aloha, which means love. Aloha is the key word to the universal spirit of real hospitality, which makes Hawaii renowned as the world's center of understanding and fellowship. Try meeting or leaving people with Aloha. You'll be surprised by their reaction. I believe it and it is my creed. Aloha to you."